The technology behind Ulthera was created through a research partnership formed in 1998 to develop micro-focused ultrasound for non-invasive treatment of liver cancer. In 2004, Ulthera was established to develop this technology for the aesthetic space. After two years of extensive pre-clinical research, Ulthera conducted 3 clinical studies to evaluate safety and efficacy of the technology. One of these studies, an efficacy study at Northwestern University in 2007, demonstrated a clinically significant brow lift in 89% of the patients treated and led to Ulthera’s first FDA indication. 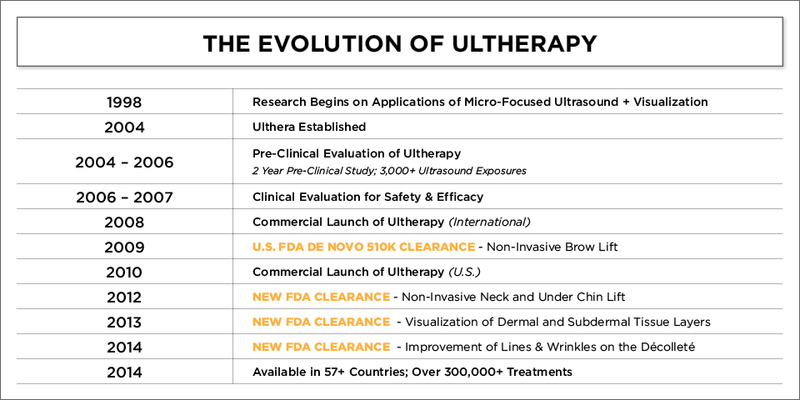 In September 2009, Ulthera was granted de novo 510K clearance from the FDA, designating the device as a new category of non-invasive technology without a comparable predicate. In 2012, the system received an FDA indication for neck and under-chin lift, and in 2013, it received a third FDA indication for visualization of dermal and subdermal tissue layers. Most recently, the system received its fourth FDA indication for improvement of lines and wrinkles on the décolleté. To date, over one million patients have received an Ultherapy treatment worldwide.